The new construction market has remained strong through April and May, and although numbers aren’t available yet, all indications are June has been a great month as well. In total, 352 new construction sales closed in April and May, which is up nearly 24% over the same period last year! 462 new construction homes pended in April and May, which is an increase of 16% over the same two months in 2014. The average sale price in May was $296,000, and the average price per square foot was $170. Inventory of available new construction homes was very consistent with last year at this time, with 954 active new construction listings in May. However, when including resale inventory the total number of available homes is down -14.9% versus May of 2014. The lower number of resale homes available should continue to help the new construction market in the coming months. 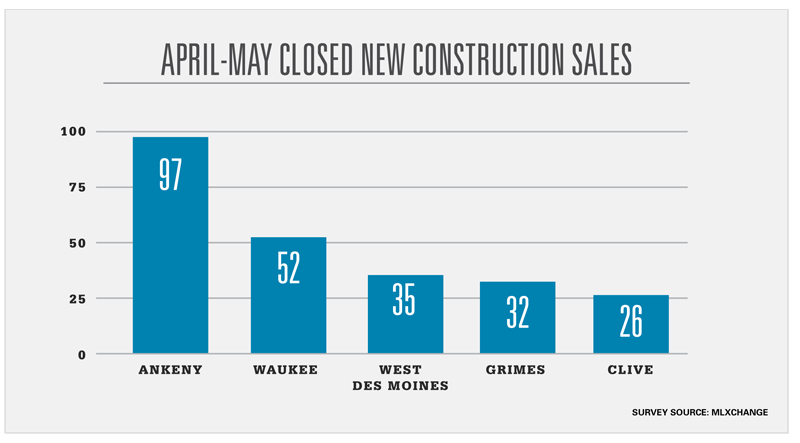 Ankeny led the way again in April and May with 97 closed new construction sales. Waukee was second with 52 sales, followed by West Des Moines with 35, Grimes with 32, and Clive with 26. I expect the final second quarter numbers to be great, and anticipate a very good summer selling season. Those that have inventory in the right area should continue to have strong sales activity.